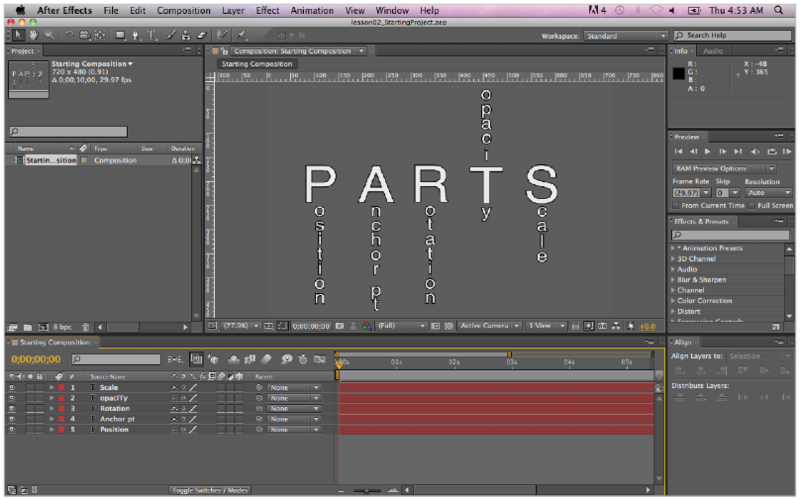 By default, After Effects uses a docked, panel-based interface to organize the work area. The entire interface configuration is called a workspace, and After Effects includes a variety of pre-built workspaces to accommodate different working styles and tasks that you may need to accomplish. You can also set each panel to move or float, independently. The default After Effects workspace is named Standard. The After Effects interface is divided into panels, where you will do most of your work. Some panels are for previewing footage or animation, and others set options for the tools, while others are for creating animation. All the panels in After Effects are accessible through the Window menu. To help you better understand the panels, we’ve divided them into two groups: Primary panels, which you will use more frequently, and Secondary panels, which you will use less often.